*Please note that entrance into the park is not included with this price. Do not purchase on line entrance tickets until you have confirmation from us that the trip is definately going ahead. As a refund may not be issued from the park… We have the right to cancel if numbers are low! 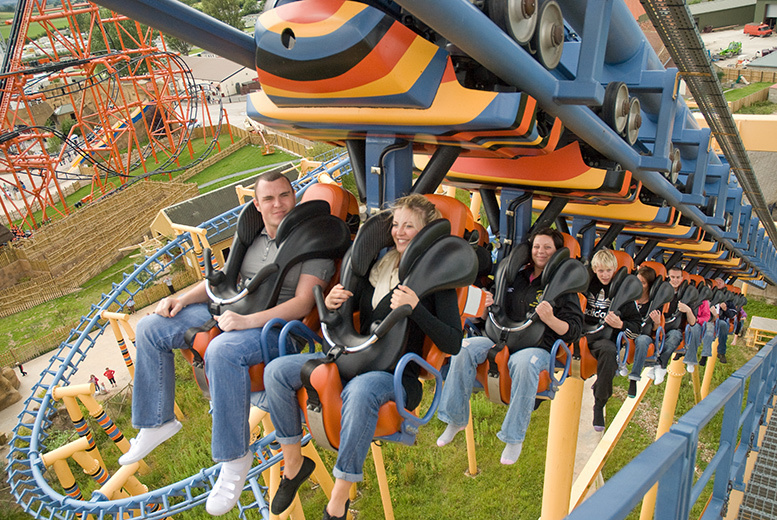 Flamingo Land Resort, Yorkshire boasts more than 50 rides and attractions for adults and children of all ages. It’s also the UK’s most visited zoo, with four amazing shows, over 140 species and more than 1000 animals. Thrill seekers can choose from Hero, the roller coaster with zero gravity flight sensation, Mumbo Jumbo, with its 112° drop, Velocity, the UK’s only motorbike launch coaster, and Cliff Hanger, a 55 m tower ride. Youngsters will love Children’s Planet, an interactive play area where they can climb, jump and tunnel amongst some furry friends. Take a trip on the Lost River Ride which takes you on a tour of African plains where the lions, rhinos, giraffes, hippos and zebras live side by side. Dino-Stone Park is great for budding junior archaeologists who can explore the interactive fossil hunt. If that’s not enough you can take a seat at one of four shows including the Bongo Warrior Acrobats, the Mia and Mylo Show, and two great animal shows featuring rare birds and sea lions. Children – £13.50 (2 – 15 yrs)…..